For the third consecutive summer, Apple released a new phone, and for the third consecutive summer, crowds flocked to buy it—though perhaps not in as large a number as they had in the past. 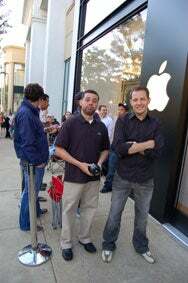 Louis Mattos (left) waits in line with an iPhone 3G to exchange at the Apple Store in Arlington, Virginia. This year’s model, the iPhone 3G S, went on sale Friday morning in eight countries, including the U.S. And while people showed up at Apple and AT&T stores to get their hands on the latest iPhone, reports from around the country suggested that crowds were smaller than for previous launches, particularly when it came to queuing up overnight. The lighter crowds are not all that surprising. Apple has sold 21 million iPhones through March 2009, and many customers who bought last year’s iPhone 3G and remain under contract with AT&T are doubtlessly balking at paying the higher fee the wireless carrier is charging some users to upgrade. Apple Store employees in orange shirts hand out water to people waiting on line at the Clarendon Apple Store. Still, people turned out at stores across the country to pick up an iPhone 3G S. In Boston, more than 120 people lined up outside of the Boylston Street Apple Store by its 7 a.m. opening, but unlike past launches of hot Apple product launches only a handful waited outside overnight. One of those was Patrick Morton, a recent college graduate who was the first in line had been using a BlackBerry smartphone on another network. The iPhone 3G S comes in 16GB and 32GB capacities and costs $199 and $299, respectively. In addition to speed and battery improvements, the new phone also features an upgraded built-in camera that can now shoot video. That addition was enough to lure some customers to stand in long lines. “I’ve always wanted to have a camcorder when I’m out and you see the most unusual things so having that camera right now will mean amazing things,” said Andy Ghobrial as he waited in line at the Boylston Street Apple store. In Arlington, Va., the crowds returned to the Clarendon Apple Store for the new iPhone’s launch. Fifteen minutes before the 7 a.m. opening, a line extended about halfway along the back of the considerable length of the mall. As the 7 a.m. launch rolled around, the doors of the Clarendon store opened on time, and a loud cheer went up from the front of the line. Apple employees allowed 18 pre-registered customers and one non-registered customer to enter the store to begin picking out their wares; a young female customer happily emerged from the store several minutes later with her new iPhone 3G S.
Pete Davenport of Falls Church, Va., showed up at 9:30 p.m. on Thursday when there were about half-a-dozen people in line. He waited until 3:30 a.m. when the number dwindled down to one person. He went home himself, caught 45 minutes of sleep and came back to find about 12 to 18 people in line or sitting on the curb. He then jumped to the front of the line and was found holding two iPhone 3Gs, which he bought just a few weeks ago and hopes to return for a free upgrade. Standing next to Davenport, Louis Mattos also held a recently-bought iPhone 3G he was hoping to return. Mattos said that he was looking forward to the iPhone 3G S’s faster processor, compass app, and turn-by-turn GPS functionality. Toward the back of the line and sporting an older Motorola cell phone, Sherry Brothers confessed that this would be her first iPhone, but that she was looking forward to “pretty much everything about it.” In particular, she was drawn by the iPhone’s Internet and e-mail features. “It’s also going to be better than my brother’s, so I’m happy about that,” she added. 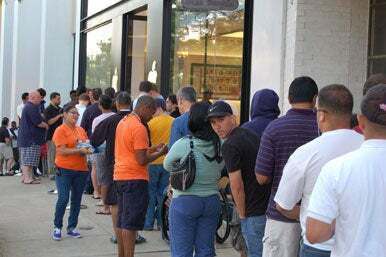 The first customer emerges from the Clarendon Apple Store with a new iPhone 3G S.
Less than 15 minutes after the doors first opened, Sasa Eric, a lanky 25-year-old IT consultant emerged triumphantly, new iPhone 3G S box in hand. He described the process as relatively simple—he chose his phone, had an Apple Store employee activate it, paid for the unit, and was good to go. Not every transaction went smoothly. One customer, Scott Struber said errors in the reservation system bumped him to the non-registered line even though he had brought his registration documents. Hiccups aside, the Clarendon line appeared to be moving briskly enough with each customer taking a little less than 10 minutes between entering the store and leaving with an iPhone 3G S in hand. The activation woes that dogged the iPhone 3G launch last summer hadn’t re-occurred on Friday morning. In fact, if you showed up early enough—at least at the Clarendon Apple Store—you could grab the new iPhone and a cup of coffee and get along to work on time. And that’s how it should be. In Rancho Cucamonga, Calif., about 300 people lined up in front of the Apple Store at the Victoria Gardens mall at dawn. The doors opened at 5:30 a.m. for customers who had pre-ordered their phones online. Fifty minutes later, all white 16GB models were sold out. By 7:00 a.m.—when the store opened officially for customers who didn’t reserve a phone in advance—all black 16GB phones were sold out as well. The line at the Valley Fair Apple Store in Santa Clara, Calif., snakes its way through an access hallway. Joe Alarcon, 31, of Fontana, was first in line for the walk-ins. He was there for a 32GB white iPhone G3 S, which were plentiful. He hadn’t reserved a phone in advance because he wasn’t eligible for a new phone from AT&T until August. But then AT&T changed its policy so that customers such as Alarcon wouldn’t be penalized. Alarcon was particularly excited about the iPhone 3G S’s greater speed and video camera. “It’s cool that you can edit video on your phone,” he said. 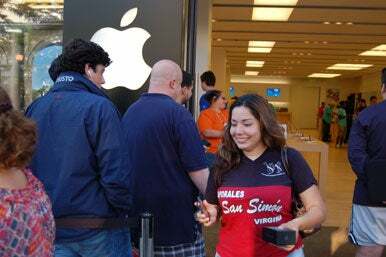 Farther north in Santa Clara, Calif., about 100 people were lined up at the Valley Fair Apple Store at 7:30 a.m.—90 minutes after the store had opened. 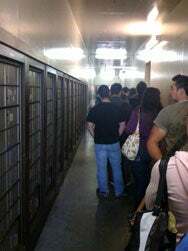 The line snaked through the mall down an access hallway and outside into the California sunshine. It took about an hour for shoppers who hadn’t pre-ordered to get their hands on a phone at Valley Fair. Updated at 9:10 a.m. PT to include reports from California Apple Stores. Updated at 10:55 a.m. with comments from the Boylston Street Apple Store. Philip Michaels contributed to this report from San Francisco, Ben Boychuk reported from Rancho Cucamonga, and Dan Frakes reported from Santa Clara. Nick Barber of IDG News Services reported from Boston.